And so here we are at Z. Except not quite. I need to go back a little in time before we come to Z properly. Many of my posts have been about houses in rural settings – manor houses and great halls. So for my last post, I’m in London because I feel I’ve neglected the urban world. Let’s begin with an architect, Charles Holden, born in 1875 in Bolton in northern England, he studied at Manchester and practised in Bolton. His earliest designs included some of the houses in Port Sunlight Village, which is close to where I live. From there, he went on to design hospitals, libraries, and a v-shaped chapel for a sanatorium, so patients could worship inside and outside in the sun. He helped the War Graves Commission design memorials for the cemeteries at Wimereaux, Messines Ridge and one at Zonnebeke for the missing New Zealanders. Back in London he was commissioned to build underground stations for extensions of the railway lines and replacement buildings for existing ones. Holden liked his designs to be simple, reflecting shapes such as cylinders and rectangles built in concrete and glass. He toured other countries to see the latest developments in modern architecture. He believed a building should be fit for purpose and not overburdened with ornamental displays. Which wasn’t the case for Zimbabwe House. Designed in 1907 by Holden for the British Medical Association, and his first major commission, the building was constructed on the Strand, and features sculptures in its facade: a series of naked figures sculpted by artist Jacob Epstein to represent the Ages of Man. They were quite explicit and shocking to the Edwardians at the time who were quite prudish. Epstein deliberately broke away from Europeans style of iconography to one influenced by India and the art of Buddhist, Jains and Hindu, especially in the hand gestures of the female figures. Controversial? Yes, but they survived the prudish Edwardians but not the health and safety laws. Pieces kept falling off the statues onto the streets below. So in 1930s, they were mutilated and bits hacked off. Now the statues look more macabre and sad, quite unfortunate. The British Medical Association moved out and the Rhodesian High Commission moved in and from 1923 the building was known as Rhodesia House until the British colony gained independence when it changed its name to Zimbabwe House in 1980. Perhaps still courting controversy, it has witnessed many protests since then. Here ends my A to Z blogging challenge. I hope you’ve enjoyed the tour of the lesser known great houses of Britain. I’ve barely skimmed the surface and there are countless more houses I could have picked, even more when you take into account the number that have been demolished or destroyed over the centuries. I’ve really enjoyed the challenge and a big thank you to my visitors and your wonderful comments. It’s kept me inspired. As a footnote – if you’ve enjoyed these posts, you might also like to read my book, which is set on the Norfolk coast and in a house that is much of a character as anyone else in the book. It also keeps a secret. A nice change of scenery for the final post. Thanks for the interesting tour over the month and congrats on finishing the challenge. Nice finish to the A-Z Challenge. Thank you for the interesting tour. I’m a life member of the NT, so a bit of a fan too. I always liked looking at the shape of the building as I walked toward it. The next time I’m in London, I’ll have to go see it – very impressive. I wonder if the old elevators are still in use. I used to be terrified to get into it. Lol. But my collection was several floors up. 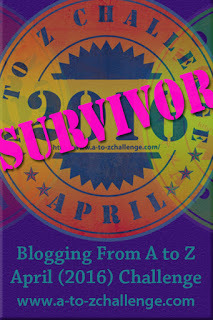 Congrats on completing your A To Z Challenge! I enjoyed the architecture and history.